According to the book History of the Mass, the fourth Sunday of Lent is what is known as the “Sunday of the Golden Rose”, from a custom observed at Rome of blessing a rose made of pure gold mixed with musk and balsam. The ceremony is performed by the Pope himself, and the rose thus blessed is carried in solemn procession in the hand of the pontiff to and from his chapel on this Laetare Sunday. The rose, symbolic of the eternal bloom and freshness of Paradise, is afterwards bestowed as a mark of special favor on some great potentate who has done service to the Holy See. Pope Pius IX sent a Golden Rose to Maria Theresa, Queen of Naples, for the kindness extended him by her and her husband when he was obliged to flee to Gaeta in 1848. He sent one also to the Empress Eugenie, wife of Napoleon III, and to Elizabeth, Empress of Austria. Laetare Sunday comes from the Introit on this day meaning “Rejoice O Jerusalem”. The Christian people raise their song of joy on account of the victory won by our Lord on the cross at Jerusalem, and there most easily, will be roused the memory of the heavenly Jerusalem, whose gates have been opened to us by the death of Our Lord, Jesus Christ. It is for this reason, that formerly on this day, it was the custom to solemnly bless a rose. 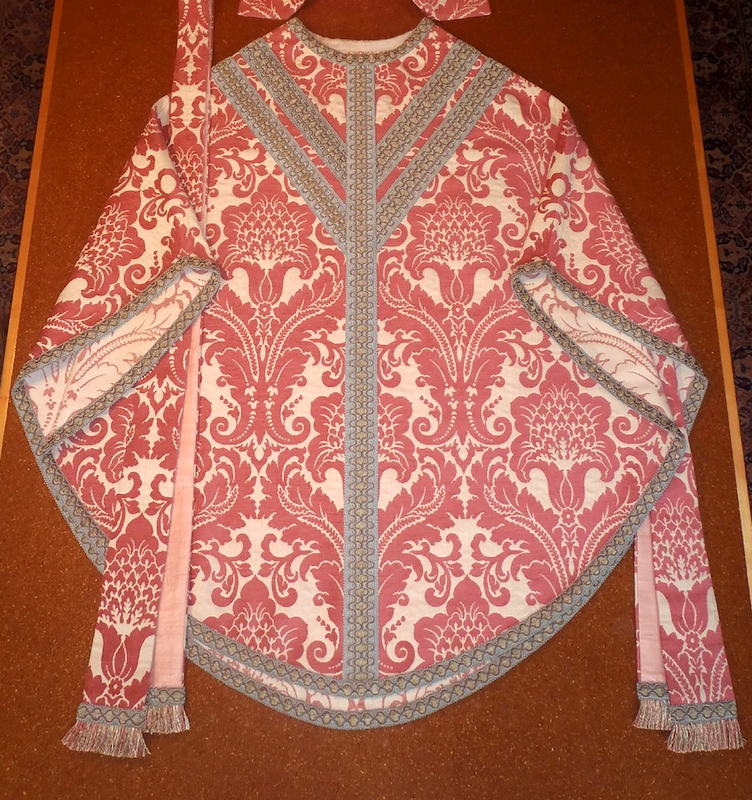 Now the cardinal and priests wear, instead of their usual color, that of pale rose-colored vestments, and on this day a priest may celebrate Mass and Office in vestments of this color. From an ancient Irish book called the Laebhas Breac, supposed to be written about the sixth century, the following curious extract is given by Dr. Moran, now Bishop of Ossory, in his Discipline of the Early Irish Church. It relates to the colors of the sacred vestments: “The priest’s mind should agree with the variety and meaning of each distinct color, and should be filled with vigilance and awe, and be withdrawn from ambition and pride, when he reflects on what the various colors typify. We are told in the Introit “Rejoice, rejoice with joy”, for having died to sin with our Lord during Lent, we are shortly to rise with Him by the Paschal confession and communion. This is why rose vestments are worn, flowers are permitted on the altar, and the organ is played.